Apparently this is only available on GSM enabled iPhones (AT&T and T-Mobile in the USA), and the Verizon and Sprint iPhone doesn’t support the feature on their networks. Users on CDMA networks can always just use the Mute feature instead though. Dont miss even more iPhone tips. What????? What has this site turned into? This used to be one of the best tip sites out there. What’s next? How to breathe? Yes, how to breathe coming up next. Relax, if you don’t like this tip you can ignore it. If you’re scraping the bottom of the barrel, just don’t post. I don’t mean this in a mean way at all, but if it takes time for you to find something worthwhile, then just don’t post something most people know, and look around for articles or something instead. Still love this site, though. Judging by the comments here you would think the world was ending. What a bunch of turds. 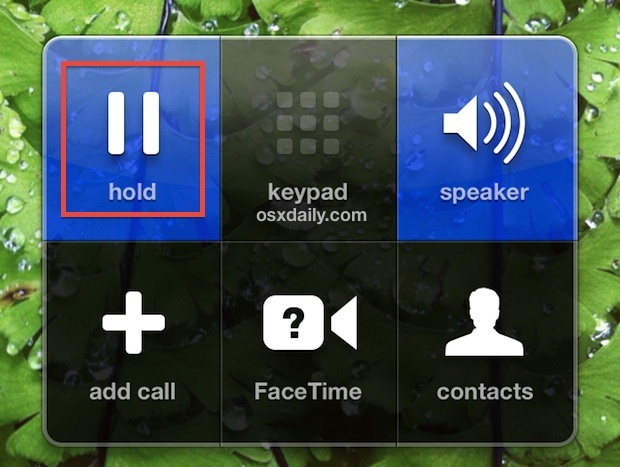 Didn’t know this, but at the same time, not sure why to use Hold instead of Mute? I guess if a person didn’t want to hear a crying baby on the line they could use this feature. I was wondering the same. Geesh people! Not everyone is as up to speed as you are I guess! I didn’t know about the hold feature on iPhone and I appreciated the tip. You could add that by tapping the “Add Call” button, you can conference with up to FIVE callers by tapping the “Merge Call” button that appears when you add a call. This may be on AT&T only. Thanks for the tip. Now, are people finally convinced that AT&T’s GSM is better than Verizon/Sprint’s CDMA network?